A laundry list of things that went on during August when I wasn't traveling to San Diego and Nashville. 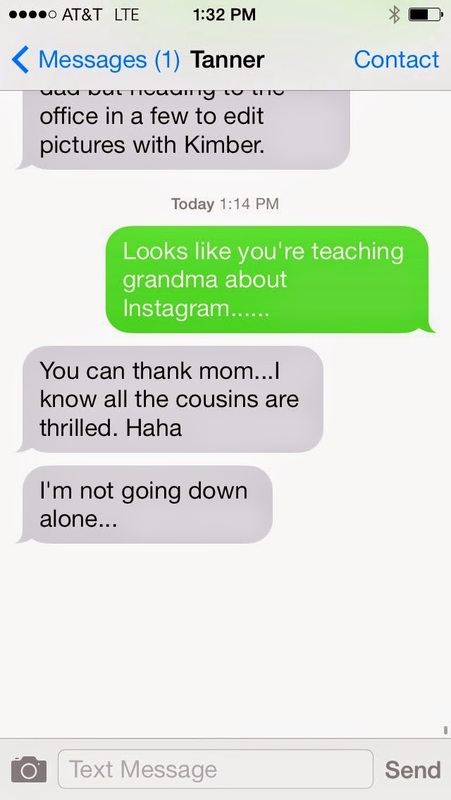 Grandma got a smart phone and joined Instagram. I blame Tanner for helping her. Our Williams Family Cousins group had some activity to talk about. I went to Provo's Rooftop Concert Series to see Dave and Davey - CSWS. I think it was Nathan? We made a night of Oh Mai and a movie and gelato. But I have no recollection what film we saw. What was out this summer? Maybe Guardians of the Galaxy? Yes, that was it, because I just looked at Nathan's FB status from then, and he always rants about the movies he sees (film professor of sorts). He said - "saw the thing with the TREE-MAN AND THE MASTERS OF THE 'COONIVERSE*..." on that day. Celisse and her coworker (blanking on her name) and I made a brunch of it back at Ruth's Diner up in the canyon. Delicious biscuits. Back to the Twilight Series to see Local Natives. I do love that band. They sounded so good. I met up with PJ there and we grabbed some Rye afterwards. Thank goodness for a new late night place in SLC. The next night Melanie and I really wanted to see Ray Lamontagne at Red Butte, but it was way sold out. We decided to hike to the hilltop above the garden to see if we could get a decent sound. About 75 other people had the same idea. We ended up walking right behind the venue - there's Ray on the phone! We waved. We could see a little and hear a little. I had to leave early to pick someone up from the airport. I think my brother? The next day Adam and I went up to the Tour of Utah at Snowbird. He was the lucky doctor that got to monitor the urine samples of some of the cyclists. Ha! We opted for the motorcycle up there. That's a great way to get in the mountain air. Adam's friend was in charge of the hospitality tents, so we had a nice hookup with food and drink and a good view. Waiting for the cyclists to come into the end of the stage. They'd biked from Park City, up over a mountain and down, then back up this canyon to the end. Nuts. Later that evening we traded the bike for a car and went to see Ben Folds with the Utah Symphony at Deer Valley. Amazing show. Ben's a musical force. Ben stopped doing Rock This B*tch for awhile, but it made an appearance tonight, with an orchestra, no less! I was so impressed and amazed. Seriously - so impressive. Someone got a pretty good video of the whole process here. Basically Ben comes up with parts for different sections of the orchestra on the fly, those talented people pick it up immediately, then he puts it all together and it makes this amazing piece of music, all in about eight minutes. Mind. Blown. Even a trumpet solo! Also, I don't remember hearing the song Cologne much before, but he told the story and then played it. I was dying - those lyrics. Please, do yourself a favor and listen to the second verse. He cracks me up. We had another Hallie birthday party with Courtney's family. More cake! Max came around to help clean up. 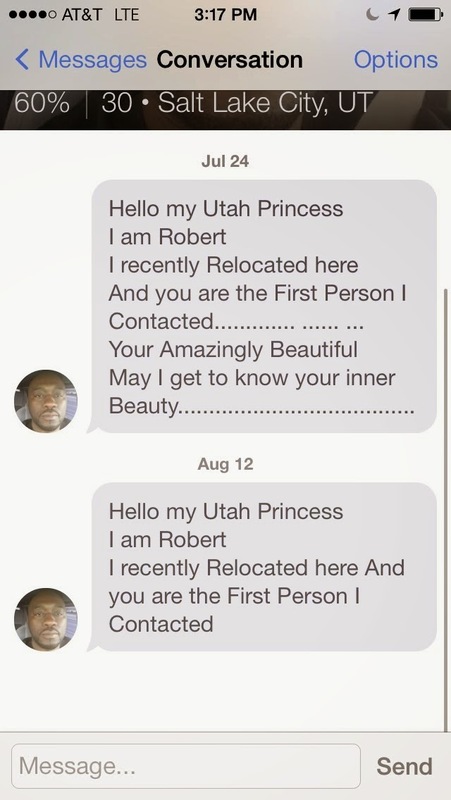 I delved into online dating. Isn't it awesome? PJ and I went to see Jenny Lewis. I want her to be my power animal - she is amazing. 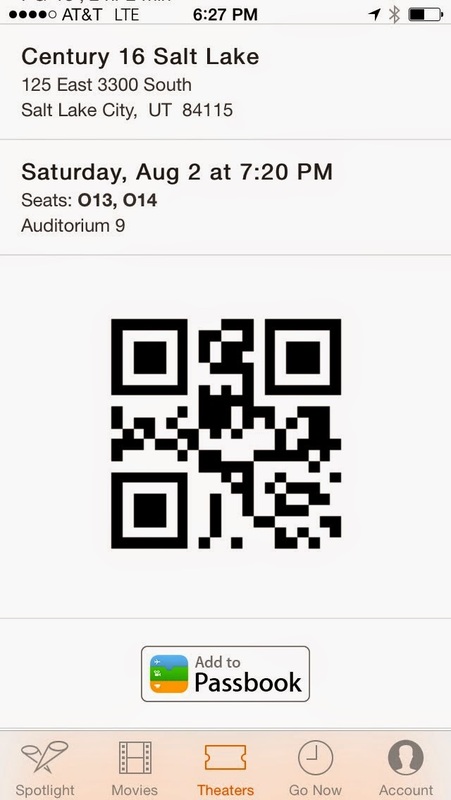 Celisse and I also found tickets to Wicked. Super sold out except for the expensive seats, but I finally found some that weren't too bad. Granted we were on almost the back row, but who cares? I'd seen it before. Still pretty great. More Twilight Series. Future Islands! Yes, dude dances as crazy as everyone thinks. He's intense and his voice gets all sorts of scary. The look doesn't go with the moves, and I can't take my eyes away. Kim C met me there later for some Beck. Beck! So good - I'd never seen him before. His genius comes across right away. I was loving it. Sadly the crowds were so large and so obnoxious that I couldn't handle it. I met Kim towards the side for some food, and we left a little early. I was kinda sad about not seeing his full set, but the crowd was awful. I guess that's what happens when it's only five bucks to get in, though I don't remember last year being as bad. But Beck - so good. After we left, Kim and I went to Rye (again) for late night dinner, and since they're hooked up to Urban Lounge next door, they usually pump the show through the speakers into the dining room. They warned us that night that a death metal band was playing, and they totally understood if we didn't want to eat there. They weren't playing the show through the audio system and still it was crazy loud. We braved it anyway. Kinda funny. Ice cream sundae event at work that I ended up taking photos for. I bought an owl shirt and thought of Chantal. I ended up at some work dinner with a major partner of ours who comes to town a few times a year. They took us to Log Haven up in Millcreek Canyon, which was pretty nice. Kind of awkward with a work dinner (I feel like I socialized much more with coworkers outside of work on the East coast, but not here), but the food was delicious and splurge-y and free. I'll take it. The venue is pretty gorgeous too. One night I went with Adam to pick up a turtle for his nephew - we ventured to some lady's house to get it. Then we had tacos, except I don't remember eating much at Chunga's. Another night Adam owed me dinner, and I made sure we went to Pago. It was very good. Somewhere in here I went to Nashville, but that's a separate post. Rob and Tashina got married - hooray! It's funny that I knew her in Phoenix and him in DC, and they met later and wound up together. I wouldn't have put the two of them together, but they're an international power couple in the making. Trevor had gone to high school with Rob (all these connections) and was neighbors with many of the guests, so he came in from LA to celebrate. I snuck away from the reception for a minute to try Art City Donuts, which were going to be down the street. Delicious hot donuts are always a yes! Taylor and Courtney came over too, since the donuts and reception were all in their town. Hallie got some donuts. That's better. And that's August in a nutshell.